Memorial Day: The Most Dangerous ATV Weekend? For ATV operators, the Memorial Day weekend is not only a great time to get their machines out of storage and tuned up for the summer, it’s also one of the most deadly weekends of the year. "The weather warms up, school is out, and it’s the time of the year that most ATV accidents happen," said 2nd Lt. Leland Owens, Minnesota DNR’s recreational vehicle coordinator. As temperatures rise, so does the incidence of ATV accidents, according to the Consumer Product Safety Commission (CPSC). Through March and April of 2010, youth fatalities rose 65% and adult fatalities were up 85%. Over the four-day Memorial Day weekend of 2010, there were 7 ATV fatalities per day. The CPSC also reported that 92% of fatal ATV accidents result from behaviors that are commonly warned against. What does that mean? Serious accidents are preventable! Always wear a properly fitted DOT-approved helmet, goggles, long sleeve shirt and long pants, gloves and over-the-ankle boots. Only ride an ATV that is properly fit for your size and age. Nearly 90% of youth injuries occur when a youth is operating an adult-sized ATV (CPSC). Do not, under any circumstances, carry a passenger on a single-rider ATV and never carry more than one passenger on an ATV designed for two people. Don’t drink and ride. Alcohol is involved in a large percentage of fatalities. Always supervise any rider that is under the age of 16. Kerry Moher, Vice President of ATVcourse.com, says, "Recent statistics from the Minnesota DNR show that 95% of fatalities occurred when operators had not taken an ATV safety course. The message seems clear. Take a course and it’s a lot less likely you will get in a serious accident." 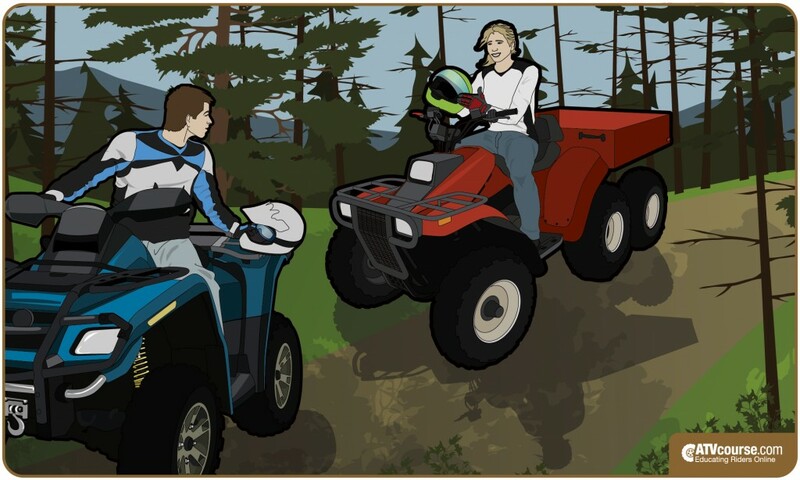 Before the upcoming Memorial Day weekend, test your ATV safety knowledge by taking a practice quiz at www.atvcourse.com. Have a safe Memorial Day and a great start to the summer!